This past Saturday dawned dark and dreary, a perfect scenario for a lazy start to a day. It also provided the perfect excuse for avoiding the autumn yardwork and cleanup. Too cold and too damp to face the tasks of packing away the outdoor furniture and raking the lawn, the weather promised me a day inside. Which unfortunately meant there was no excuse for not getting to the housework. After a long week at work this drudgery is tackled grudgingly on the weekends. Avoidance is practised at every opportunity, but too often there's no way to get out of it. When this happens I throw myself into the task, find the zone to the accompaniment of some great oldies played at full volume, and eschew distractions. In this scenario I am a woman on a mission, focussed on the job and driven to complete, with perfection, but in record time. Interruptions, therefore, are met with something just short of hostility. Family knows, it's best to stay out of my way. Occasionally, though, there are those unaware of the rules. Since I'm a relatively civilized person, for them I must force a smile. Eventually. Intent on my labours Saturday I reacted initially with all of the charm of a crazed animal to the sound of knocking at my front door. First there was the snarl as my head turned sharply towards the offending noise. Then with teeth bared and eyes afire I stomped over to answer. And there, with beaming smiles were two members of our local Cadets. They too had a mission on this particular Saturday. 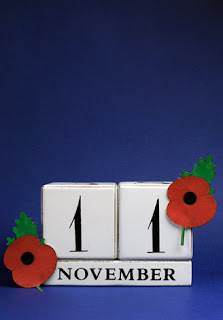 It was the start of the annual Poppy campaign for Remembrance Day. Every year, the Legion honours its veterans, using the sale of poppies to support them and their families. All Canadians are asked to wear a poppy to honour those who gave their lives for freedom. Representing the sacrifice of those who have fought for democracy, it's a symbol we keep close to our hearts. Its story and the connection to war and conflict began with In Flanders Fields, a poem by Lieutenant-Colonel John McCrae, which describes the wild poppies that flowered among the crosses of the fallen in a region of Europe near Belgium. A Canadian physician, McCrae penned this now famous verse after seeing his friend, a fellow soldier, killed the day before. The poem was first published in December, 1915. Its significance as a symbol of remembrance began humbly when an American teacher, Moina Michael read In Flanders Fields and vowed to wear a poppy as a sign of remembrance. According to the Legion's website, it was a French woman, Madame Guerin, though who first began selling handmade poppies in 1920 to raise funds to help the children living in war-torn areas of her country. Then following her example, the Great War Veteran's Association in Canada, adopted the practice. The poppy became the official Flower of Remembrance on July 5, 1921. As I faced these two young men at my door on Saturday, chagrined by my attitude when I first answered the door, I issued an apology for my curt response. I was, I explained, deep into cleaning and feeling a little harried. "Ma'am," he sent a charming smile my way, "that is a most important job." Now I was truly humbled. With the exception of motherhood, there is nothing in this life of mine that could begin to compare with the contributions and sacrifices of our veterans. I can't take back the self-absorption of Saturday, but I can wear that poppy to show my gratitude and my understanding of all that our soldiers have given. At high cost they fought in order for us to live in a place of freedom, where the worst thing to happen to us is interrupted cleaning on a Saturday morning.